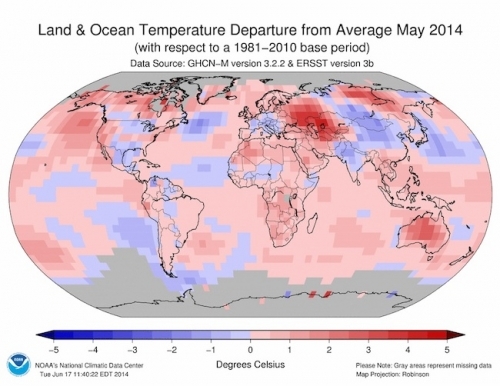 How tempartures around the globe departed from average in May 2014, with warmer-than-normal areas in red and colder-than-normal in blue. “I agree that 2014 could well be the warmest on record, and/or 2015, depending on how things play out,” said Kevin Trenberth, a climate scientist with the National Center for Atmospheric Research in Boulder, Colo.
For 351 months in a row, or more than 29 years, global temperatures have been warmer than average. May 2014 was the 351st month in that uninterrupted series. 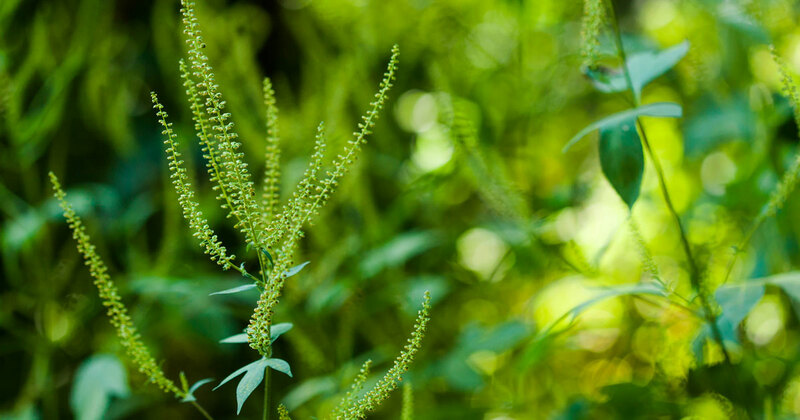 The record-setting May came in with an average temperature 1.33°F above the 20th century average for the month (58.6°F), according to figures released by the National Oceanic and Atmospheric Administration. Data from the Japanese Meteorological Agency and preliminary data from NASA (which doesn’t include records from China) also ranked May in the top spot. 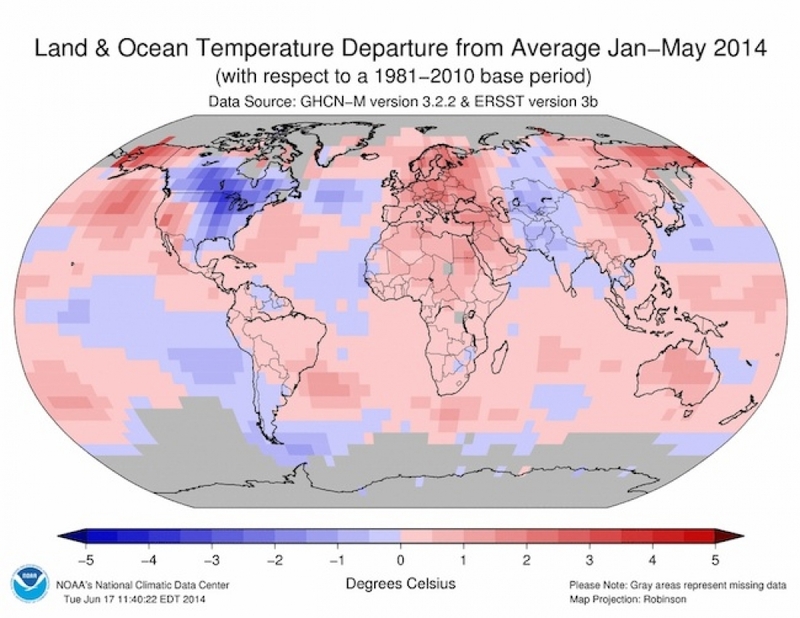 The ranking follows on the heels of an April that was ranked the warmest on record by NOAA and second warmest by NASA (the two agencies process their data slightly differently, but their rankings typically vary only by tenths of a degree) and a March that both agencies ranked as the fourth warmest on record. The ranks of the warmest years humans have recorded have been filling up with recent entries, driven by the unrelenting heating of the planet caused by the accumulation of greenhouse gases in Earth’s atmosphere. 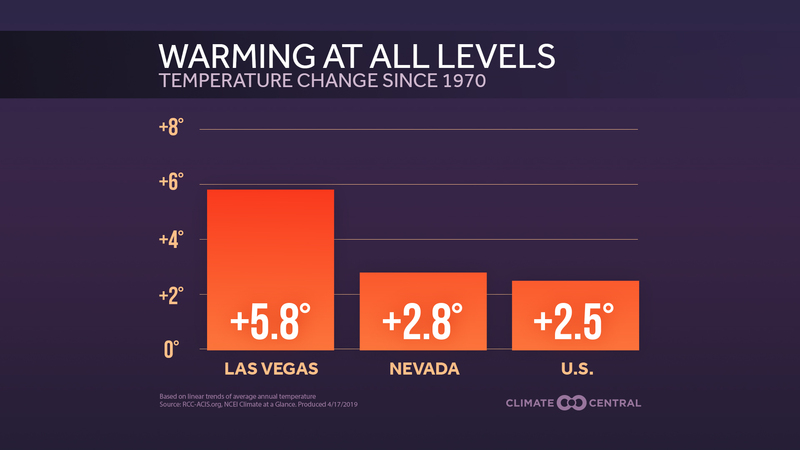 Each of the past three decades have been warmer than any other decade since 1850, according to the most recent Intergovernmental Panel on Climate Change report, and 13 of the 14 warmest years on record have occurred in the 21st century. The warmest year on record was 2010 (NASA has it tied with 2005). While a La Niña event — the cold counterpart of El Niño, which tends to depress global temperatures — kept 2011 and 2012 out of the upper echelons of warm years, they were still warmer than the 20th century average. After the La Niña dissipated, temperatures rebounded in 2013, which was ranked as the fourth warmest (tied with 2003) by NOAA and seventh warmest (in a three-way tie) by NASA. 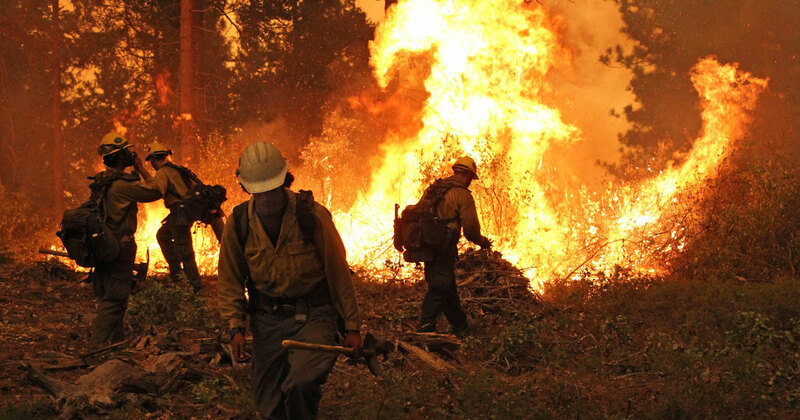 While 2013 was a middle-of-the-road year for the U.S. in terms of temperature, Australia saw its hottest year on record by a sizable margin, as heat waves baked the country during summer. Most other parts of the globe also saw warmer-than-normal temperatures, which boosted the global average. The temperature trends in 2014 have followed a similar pattern: The U.S. has run a slightly below-average temperature for the year so far, thanks in large part to the persistence of cold, Arctic air dipping down over the eastern portion of the country, while the western states baked. Meanwhile, Australia was once again plagued by summer heat waves and had its third warmest autumn (spring in the Northern Hemisphere) on record. The 12 months ending in April 2014 were the warmest such period on record, expected to be eclipsed by the period ending in May. Europe and much of Asia have also seen a very warm start to the year, with, for example, Norway recording its warmest spring in more than 100 years and South Korea its second warmest. The climate phenomenon that could give the year an extra boost, El Niño, is being closely watched. Though neither NOAA nor Australia’s Bureau of Meteorology have officially declared one to be in place yet, it is expected to fully emerge later this summer or in the fall. The globe hasn’t experienced a major El Niño event since the one from 1997-1998 that wreaked havoc on the world’s weather and sent global temperatures soaring (1998 is the only non-21st century year in the top 10 records). The higher ocean surface temperatures that characterize an El Niño tend to add heat to the atmosphere, which loads the dice for a warmer-than-average year beyond what global warming contributes. It’s sister La Niña tends to cool temperatures, but even recent La Niña years have been well above the 20th century average. In fact, another climate cycle, the Pacific Decadal Oscillation, which can stay in one phase for several decades, has been in a state that favors La Niña-like conditions since the last major El Niño. But still the early 21st century dominates the temperature records. Climate scientist Michael Mann, of Penn State University, likens El Niño and La Niña to waves on a rising tide. Even though the waves can cause year-to-year blips, the overall rise in temperatures continues unabated. How tempartures around the globe departed from average from January through May 2014, with warmer-than-normal areas in red and colder-than-normal in blue. “In the bigger scheme of things it is the long-term trends that are most important, and those are the same regardless of whether you select La Niña or El Niño years (the latter always being a little warmer than the former),” said climate scientist Gavin Schmidt, director of NASA’s Goddard Institute for Space Studies in New York. The exact effect the emerging El Niño has will depend on when it fully ramps up. The biggest impacts on global temperature tend to happen in the Northern Hemisphere winter, so 2015 could be more affected than 2014, Trenberth said. “If 2014 does make it then I don't think it will be by much,” he told Climate Central in an email. Even if 2014 doesn’t take the top spot, it could still fall somewhere in the top 10 globally. The bottom line all three scientists emphasized was that the year-to-year variations matter less than the background trend, something made clear by the record-warm years that have happened in the past couple decades without a major El Niño to push them along.